No time for much of a newsletter this week. We are in the process of cleaning all that garlic we dug up two weeks ago. 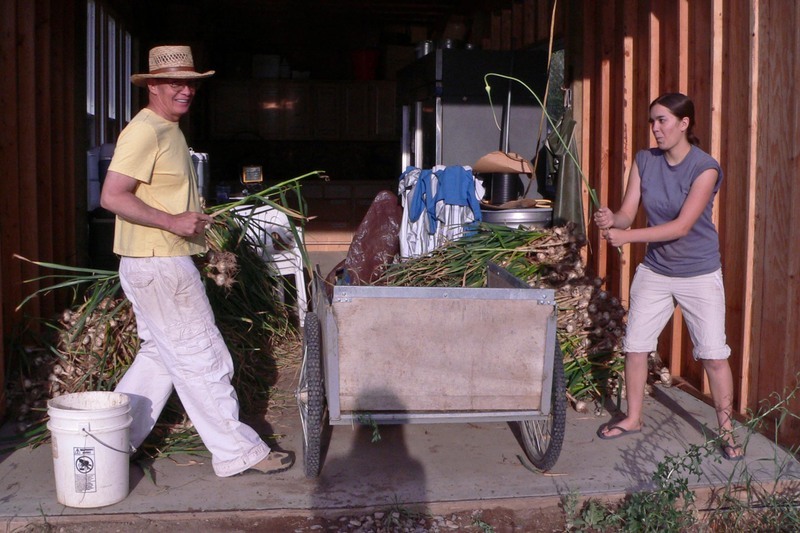 You are getting a pound of German Extra Hardy Garlic with your share this week. 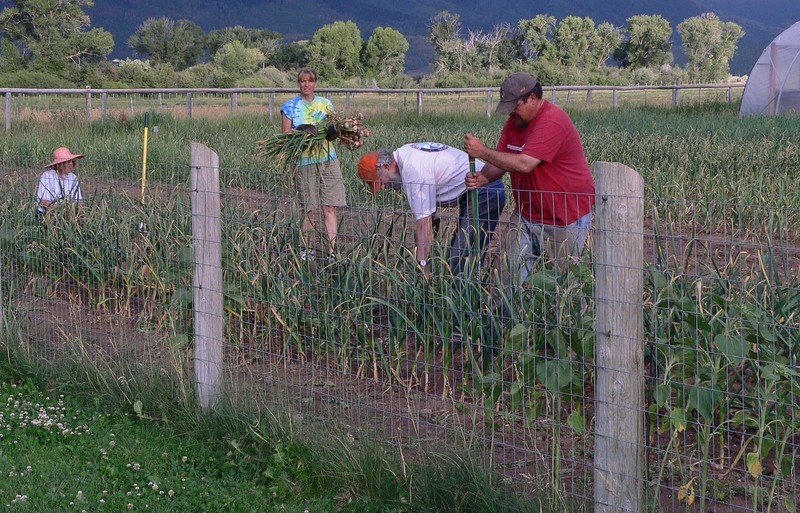 This garlic has been patiently and earnestly developed over many years. Each year the very best and biggest cloves are selected to replant in the fall. You can see the results of this process when you look at the size and quality of our German Extra Hardy Garlic. The taste is also incredible. It has a full-bodied flavor. The giant bulbs are excellent for roasting. This particular garlic also "brings on the heat". You'll be getting another type of garlic in the next week or so, just as soon as we can get it all ready. Speaking of which, I've got to go back to work now. 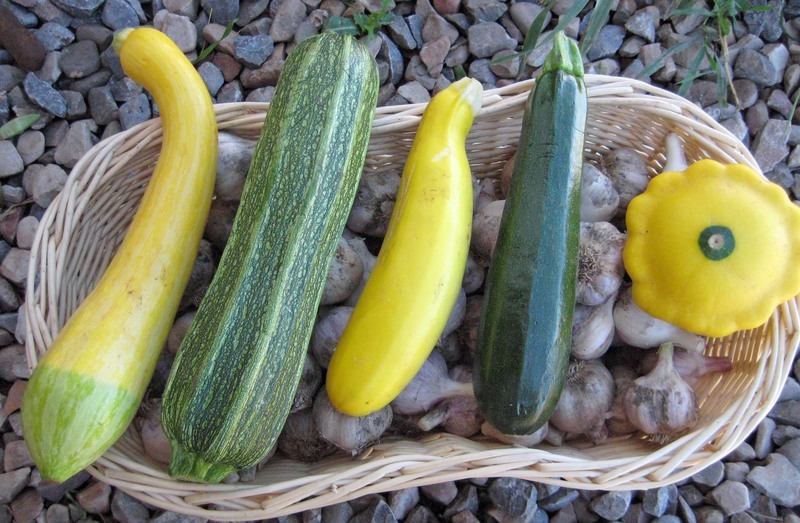 We are growing 5 varieties of Zucchini & Summer Squash this year. Zephyr Summer Squash - slender with a light green blossom end. Firm texture when small. Costata Romanesco Zucchini - an Italian zucchini with prominent ribs, holds it's flavor and texture well as it increases in size. Good as a "stuffer" zucchini. Yellow or Golden Zucchini - bright golden skin with white flesh. Black Zucchini - dark green skinned and mild flavored. Patty Pan or Scallopini (also a summer squash) - round shape with scalloped edges. It's tender flesh can be scooped out, mixed with other ingredients and reinserted for cooking. Also know for it's decorative appearance. As I was out harvesting today, I asked my fellow farm workers how they would describe the taste of zucchini and squash. I also asked them to describe the difference between the two. What I mostly got was a "Hmmm", "Uhhh" and "I'm not sure". It made me feel so much better. Quite frankly, that's how I feel too. Unless you were to line them all up in a row and do a blind taste test, I'd say they all taste about the same. But even then, I'm not sure how to describe how they taste. The seed catalogs use words like "delicious nutty taste" and "mild flavor". What does that mean? One worker with an obviously more developed palate than mine said "Zucchini takes on the flavor of the ingredients you are cooking it with, while squash has it's own taste". OK, I agree with this. So, how would YOU describe the taste of zucchini and squash? Do they taste the same or different? I'm thinking I need to do some experimenting to get to the bottom of this. Speaking of tasting squash... Shain's been cooking again. 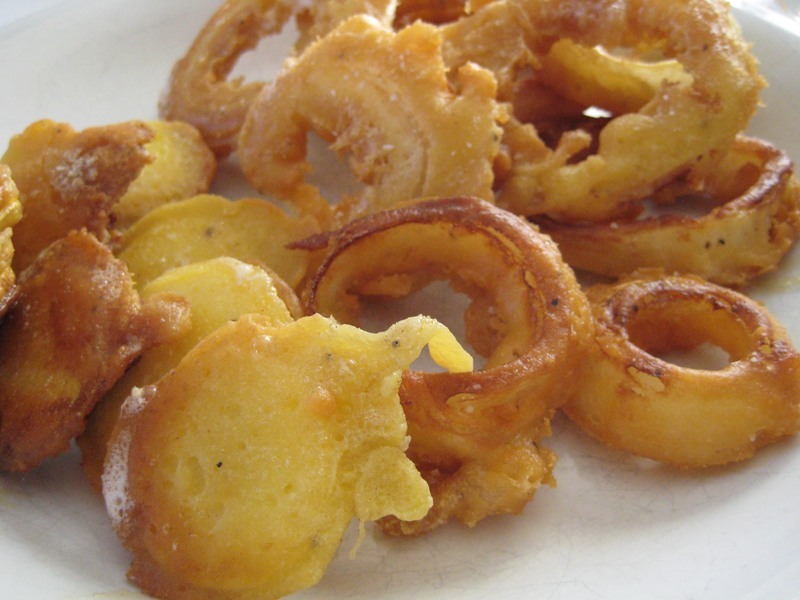 He just had to make some beer battered onion rings and summer squash. They were quite tasty. If the onion crop turns out to be anything like it was last year we are all in for a big treat. We planted two kinds of sweet onions again this year, red and yellow. They are ready to start harvesting this week and they'll keep getting bigger. Now, just in case any of you are wondering if I ever spend time in the kitchen, the answer is "yes". I just don't want to get in Shain's way. I don't want him to feel intimidated. I don't want to ... cook. Hey, I'm being honest here. And I'm usually still out working, or doing laundry, or writing this newsletter, or calling our accounts, or ... something. I'm a busy girl. Besides, Shain likes to cook. How can I take this joy away from him? But the other day I did venture into the kitchen. Truth be told, I was trying to find something in the fridge and I went a little crazy because the fridge was so full of produce that I couldn't find what I was looking for. So I took out all the left over veggies and determined they needed to go. I needed to cook them NOW. So I did. I cleaned up a big bowl of various items like turnips, fillet beans, beets, carrots, snap peas and whatever else was there. I put them on a cookie sheet, drizzled them all with a little olive oil, and put them into a hot oven. My family's comments were not positive. They were certain I was only making a mess and had no intention of eating my "roasted leftovers". They must have been hungry, or curious, because the veggies I cooked up didn't even last long enough for me to take a picture. So there you have it. I was a success in the kitchen. Oh, and on top of all those veggies, I had the most delicious Roasted Tomato & Garlic Mayonnaise Sauce. Then I had the same sauce later on a hamburger. Then on a BLT. Then last night when we were eating the battered onion rings and squash, I wanted more sauce. It was that good. I've done it again. I've made myself completely hungry while writing the newsletter. Shain...where are you? I'm hungry. Here's a pretty picture to end with. 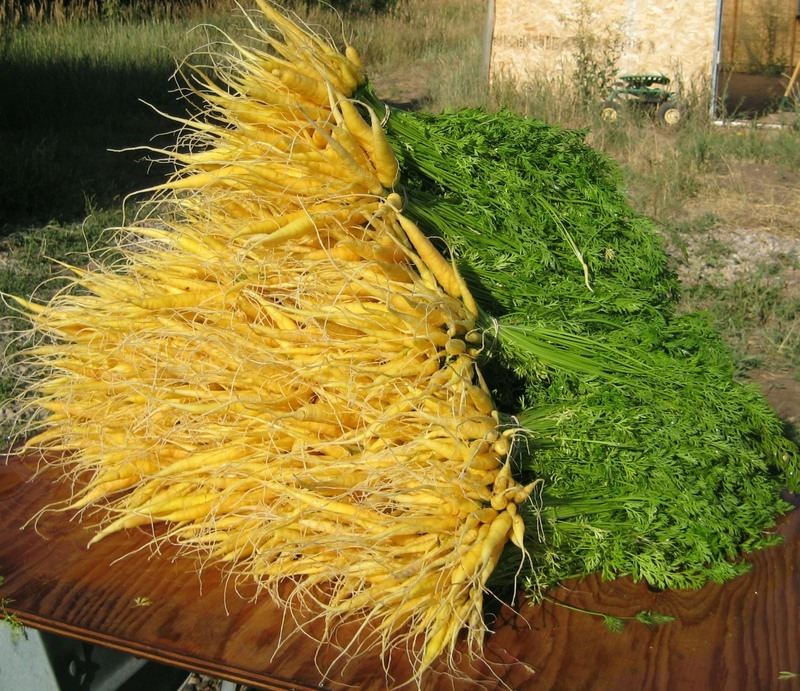 You'll be getting yellow carrots in your share this week. These carrots are less sweet, more fibrous and dense, and are more suitable for cooking or roasting, during which they will maintain their firm texture. Swiss Chard - some bags will also contain a few leaves of kale. 1) Some crops have to be harvested or they go to waste, like the last of the peas (this week) and the first crop of French fillet beans (last week). These crops are time consuming to harvest. Some crops are bolting from the heat, like the cilantro. 2) This week we had to get the greens picked because the grasshoppers are coming on so strong and doing a lot of damage. (By the way, there are more holes in your Swiss Chard this week than I'd normally feel comfortable distributing. It was that or nothing.) Luckily the grasshoppers are not getting into the salad, not as much at the caterpillars. With this in mind, we'll do our best to get salad out to you again next week. Speaking of GRASSHOPPERS. They are here now. In full force. Remember how I wrote back in the beginning of the season about our trick of planting basil along side the tomato plants. I explained how bugs are really attracted to the basil and will choose it over the tomatoes. Here's a picture of the damage bugs will do. This is mostly caused from grasshoppers. 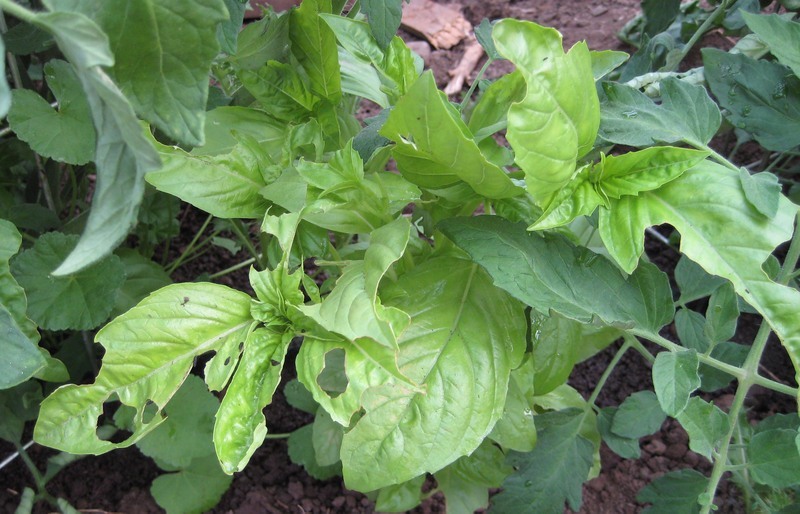 Earwigs and ants like basil too. Who can blame them. It rained this week in Star Valley. Someone told me it always rains during fair week. I'll have to remember that when we schedule next year's garlic harvest. 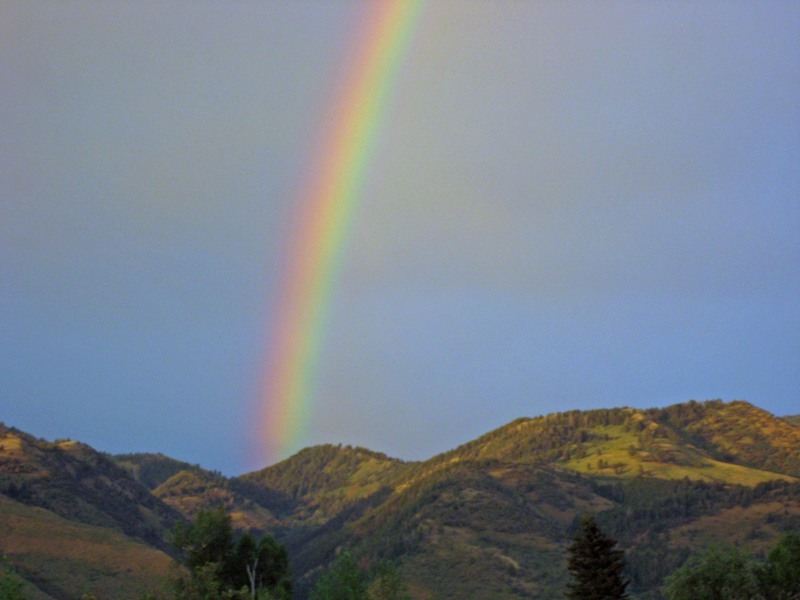 We had a lovely rainbow here on the Southern end of Star Valley this past week. One thing I had never experienced before moving here is seeing a complete rainbow, from one end, up over the arch, and down to the other end. I've only seen this a handful of times and it is something I really enjoy. But it's not easy to get on film if you are too close. This particular rainbow seemed to be right out my front door. 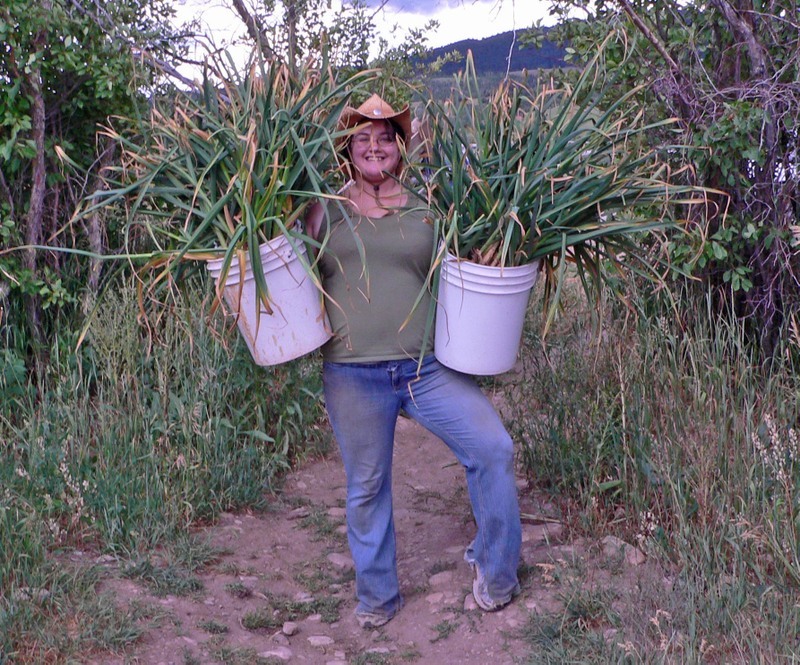 The garlic harvest is going well, despite the rain. I am not going to complain about the rain. 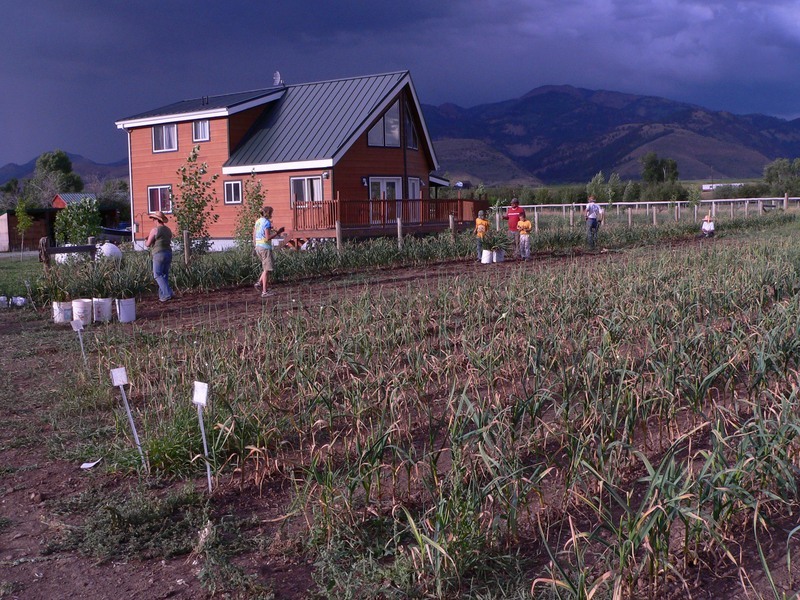 However, it is a little crazy how we go for weeks without a speck of moisture from the sky and then when the time comes that we need to dig up the garlic, it rains. It rained a lot in the evenings and at night making it less than ideal to harvest in the morning. The idea is to dig up dry garlic. Not a garlic bulb covered in mud. Fortunately, the ground dried up enough during the day that we were able to dig away in the evenings, before it started to rain again. See those dark skies in the photo above? Thank you to those who came to help. Hard work is much more fun with many helping hands. Especially when some hands are stronger than mine. Hey, I think some people were having a little too much fun. Get to work you two. After the harvest is dug, we sort it for size. The biggest bulbs are saved to plant again. This is how we are able to have such nice big German Extra Hardy garlic (the kind of garlic you got last week). We are starting this same process on a few other garlic varieties, which I'll introduce you to in another post. This week you are getting two bulbs of Spanish Roja. You'll notice the size is comparatively smaller than the German Extra Hardy. With selective planting, and 5 or more years of dedication, we hope to develop it into a bigger sized bulb too. The zucchini and squash are on. Shain cooked us up a tasty dish this past week. 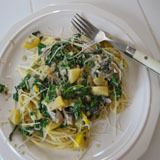 First, he sauteed sliced mushrooms and pieces of summer squash in garlic and butter. To the pan, he added about 1 cup of cream, 1-2 Tbsp Balsamic Vinegar, and salt and pepper to taste. Next, he add about 4 cups chopped greens (spinach, Swiss Chard, Kale or whatever you have on hand). 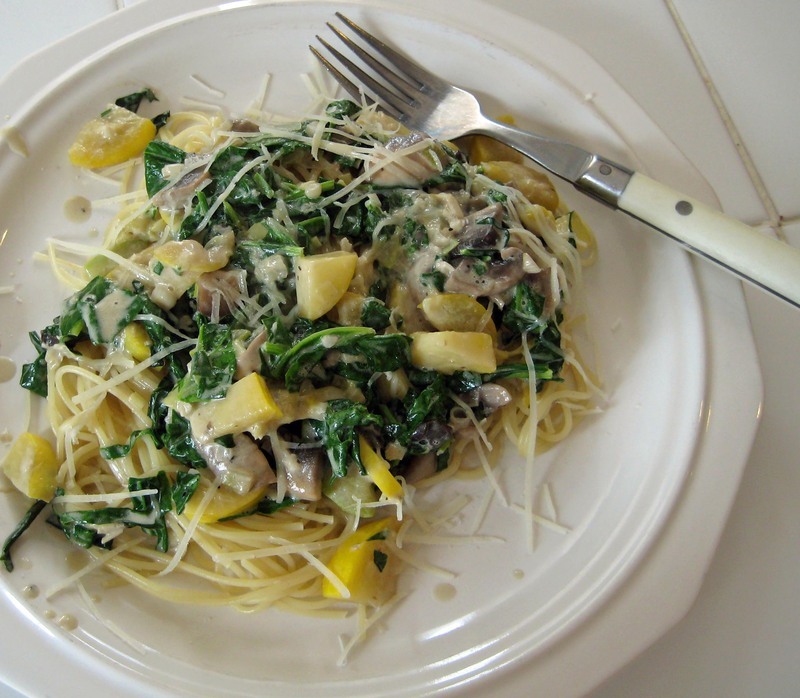 Then he tossed it with angel hair pasta and topped with Parmesan Cheese and minced fresh basil. 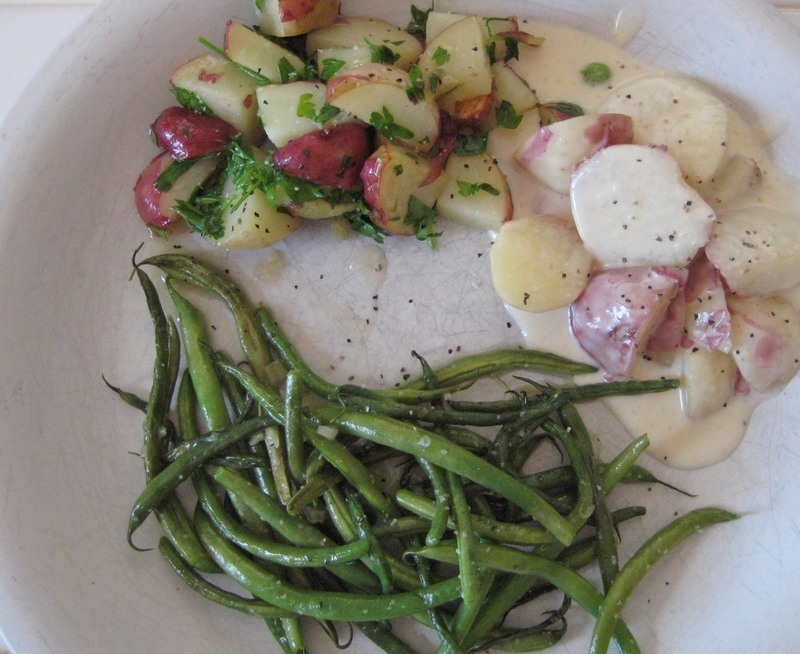 We planned this week's harvest with two meals in mind: Creamed New Potatoes with Peas and Sauteed Fillet Beans with Garlic. We had try out our recommendations ahead of time. Shain was so eager to eat these delicious recipes that he made them ALL for one big mid-day meal. We had another tasty treat this week. 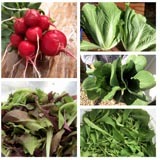 Rene, one of our dutiful CSA Workshares, brought us a yummy treat to munch on while working. She called it Cilantro Pesto. I posted the recipe here. Shain had a little bit of it on a pork chop tonight and said it's a winner. 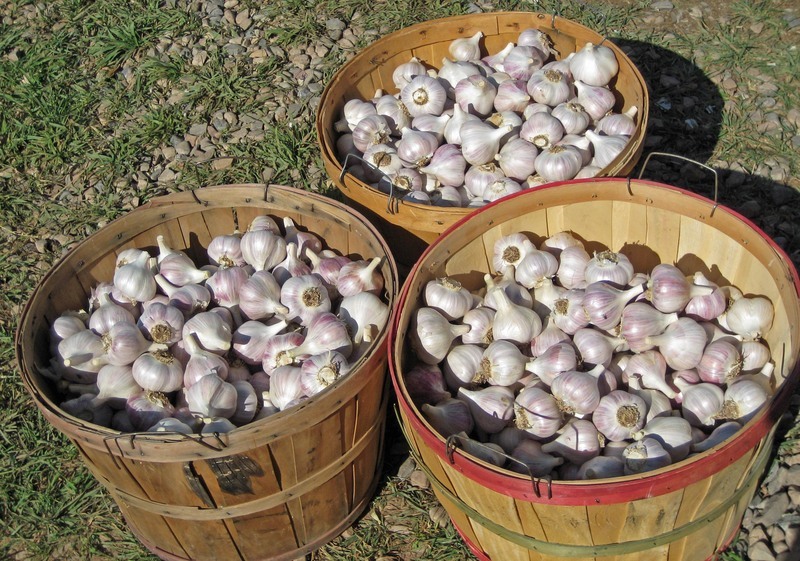 You are getting a bulb of fresh garlic in your bag this week. It's freshly dug, just a day or two ago. The taste is incredible. We've been waiting patiently for the garlic to be ready and it's just about there. We'll start digging up the long rows this weekend. Then it will be hung in our shed, and on my deck, and who knows where else for two weeks to "cure" or dry out and be ready for storage.